The dining room is one of my favorite rooms, it was the first room I 'fixed' up. We used to never go in there, now it's like a real part of the house! The stencil on the wall is from Cutting Edge Stencils. The print is Katie Daisy in a homemade frame. The bench was ugly and then I recovered it in a fun fabric. The pink pillow I made, the other is from Home Goods. 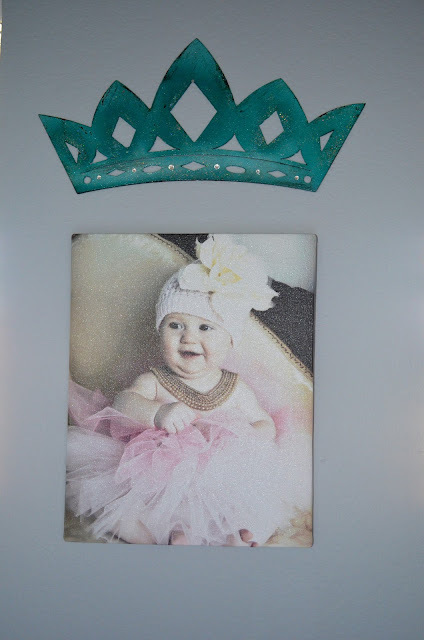 My sweet girl when she was just a wee lass, metal crown from Canton. Sign from Hobby Lobby and the light fixture is from Crate and Barrel I think. Ahhhh my PINK dining room table! I love how bright and cheery your room is! I have spent years toning down my house from the previous homeowner and now I need to add color! I seriously want you to come decorate my house! such a fun fun room! i love the pink table! You've got a great style! You did an amazing job with this! I think it would cool to add some paint behind your gorgeous Ms. Bambina! Even something funky like stripes. That room really does put you in a good mood haha! awww love that picture of madison with the crown! you're so darn creative!!!! I love your style! My husband would never go for it though. 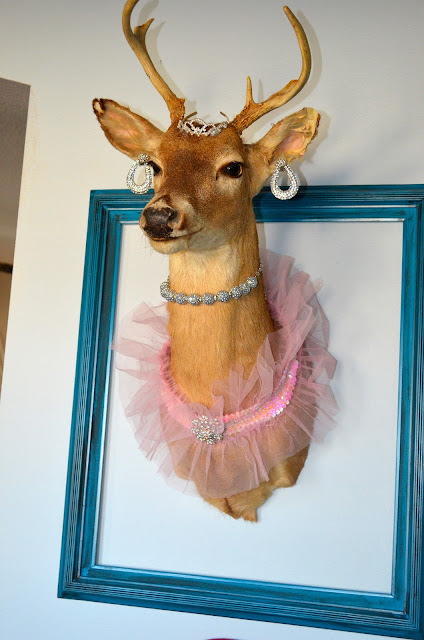 But, it would be fun to dress up his deer as bambina one day! I need a Bambina! That is awesome! I love it! It's kind of like a fairy tale! Very cute and fun! I wish my hubby would let me decorate like this! Your husband is one crazy cool man for letting you do that to ya'lls house! Mine would wig the f out if I threw in a pink table. LOVE the hutch! Your dining room is so flippin cute! I love the wow factor in bold colors and whimsy. Perfect combo! omggg i loveee your dining room! especially the pink table!! 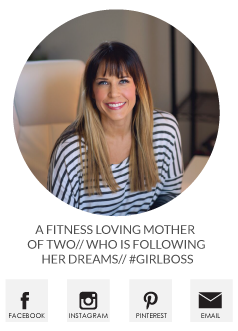 :) New subscriber here (from MamaLaughlin)& k=loving your blog so far! LOVE LOVE LOVE your home tour! Your taste/designs inspire me to do more with my house!! Beautiful home you have!! NOTHING better than pink in a room! Wow, this is so unique! 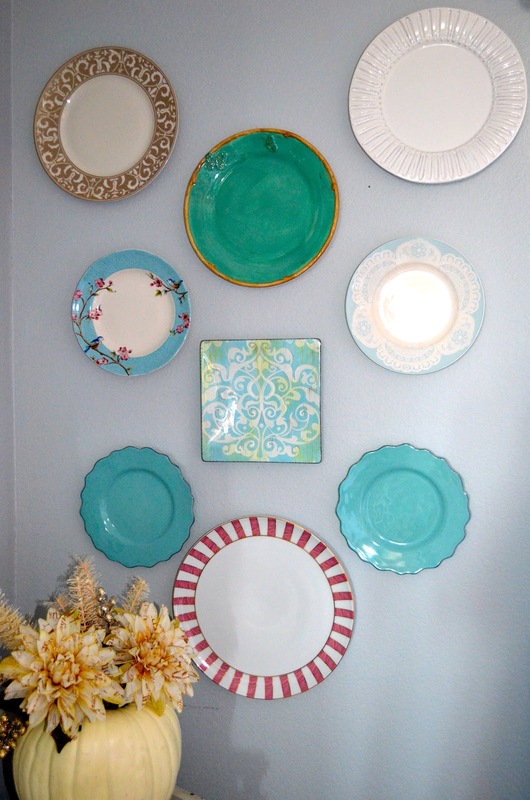 I love the wall stencils and the assortment of plates on the wall! Such a happy and colorful space :) Love it! I love your home! I want you to come to WA. and do my house! 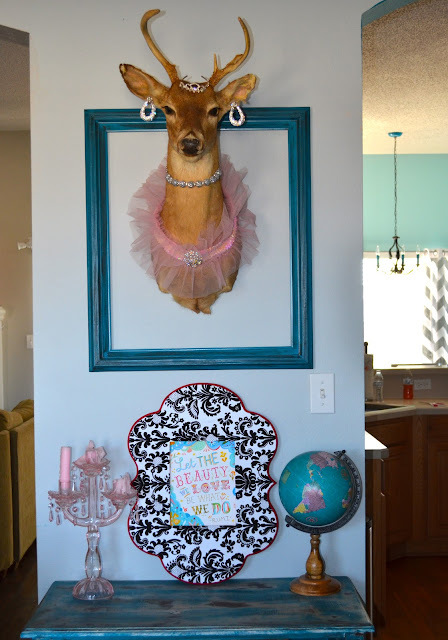 I've been begging my husband to find a mounted deer head so I can copy bambina. He thinks I'm nuts, but his hunt is on. Sadly our basement has all sorts of his tacky mounted horns from hunting trips but no head...someday! I love this room. You did a fantastic job making it cheery and welcoming! This is such a gorgeous room. I'd never want to leave. Love Bambina and LOVE little tiny Miss M.
OMG! I LOVE THIS ROOM!!! Such a great idea for the deer! I would love your house..if I was 16. How does your husband live there? I can't even handle all that pink & I'm very girly.